Drawing on a rich trove of documents, including correspondence not seen for 300 years, this study explores the emergence and growth of a remarkable global trade network operated by Armenian silk merchants from a small outpost in the Persian Empire. Based in New Julfa, Isfahan, in what is now Iran, these merchants operated a network of commercial settlements that stretched from London and Amsterdam to Manila and Acapulco. The New Julfan Armenians were the only Eurasian community that was able to operate simultaneously and successfully in all the major empires of the early modern world—both land-based Asian empires and the emerging sea-borne empires—astonishingly without the benefits of an imperial network and state that accompanied and facilitated European mercantile expansion during the same period. This book brings to light for the first time the trans-imperial cosmopolitan world of the New Julfans. 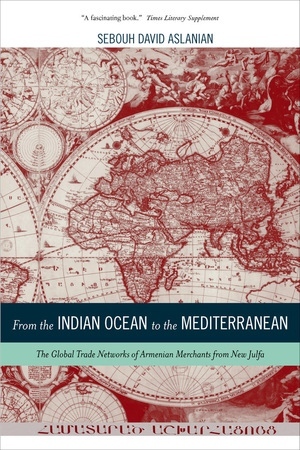 Among other topics, it explores the effects of long distance trade on the organization of community life, the ethos of trust and cooperation that existed among merchants, and the importance of information networks and communication in the operation of early modern mercantile communities. "Sebouh David Aslanian draws upon an unrivaled body of original documentation, collected in seven languages from twenty-five archives, to reconstruct in great detail the logic and working of a global commercial network. He poses a series of fundamental questions concerning the Julfan network and critically assesses both the received literature and the very documentation on which he grounds his revisionist study, making this a valuable contribution to comparative economic history." "From the Indian Ocean to the Mediterranean is without question an exceptionally interesting, well-researched, and original study. The work is the product of lengthy and determined exploratory archival research whose global reach reflects the far-flung trading network of Aslanian’s subject. Compared to previous work on the Julfa Armenians (or the trade of the Safavid Empire in general), it is on an altogether higher level of theoretical sophistication."